Official artwork of an Orne as it appears in Uprising. Ornes (オーン, Orne) are members of the Underworld Army in the Kid Icarus franchise. They appear as a giant horned skull with a mass of smaller skulls. Orne Idol from Kid Icarus: Uprising. Ornes were introduced in Kid Icarus: Uprising as one of the Underworld troops. Although they simply move about a pattern and rarely seek Pit out, they would instantly cause death on contact with him, and are the one non-boss enemy that can do so. They are invulnerable to all forms of weaponry except for the Arrows of Light. Ornes rarely appear as enemies. Like in Uprising, they slowly pursue players and instantly KO them on contact. It does not deal any damage, but its unique Obliviate effect instantly KOs anything that touches it unless invincible or intangible. As an added auditory cue, the currently-playing music will be replaced by music from Uprising that would play whenever Ornes got close to Pit. Orne is immune to all damage and knockback: therefore, the only defense from it is to either avoid it entirely, or use rolls, air dodges (spot dodges aren't recommended) to become intangible and safely pass through it, or using Powers such as Warp and Brief Invincibility. Orne moves faster if the player's back is turned towards it. The Super Star can allow players to touch Orne without evading or being KOed, but they still cannot KO it, or even make it flinch. One of the Challenge Doors involves dodging an Orne until the timer runs out. The same room also contains Souflees, and attacking them can be a risky but rewarding task. This creepy ghost, covered in fire, first appeared in Kid Icarus: Uprising. If it shows up nearby, you'll hear eerie 8-bit music and get chased. Don't even think about fighting it—it's invincible and will instantly KO you if it touches you. Just run! 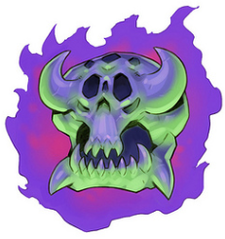 A fire demon shrouded in purple flames, as seen in Kid Icarus: Uprising. If it gets close to a fighter, it'll immediately start to chase after them to the sounds of creepy 8-bit music. Not only is it completely invincible, but one touch from it is an instant KO! Don't get in this one's way - it's really not worth it. The music that plays when within close proximity of an Orne. This page was last edited on November 13, 2018, at 16:06.